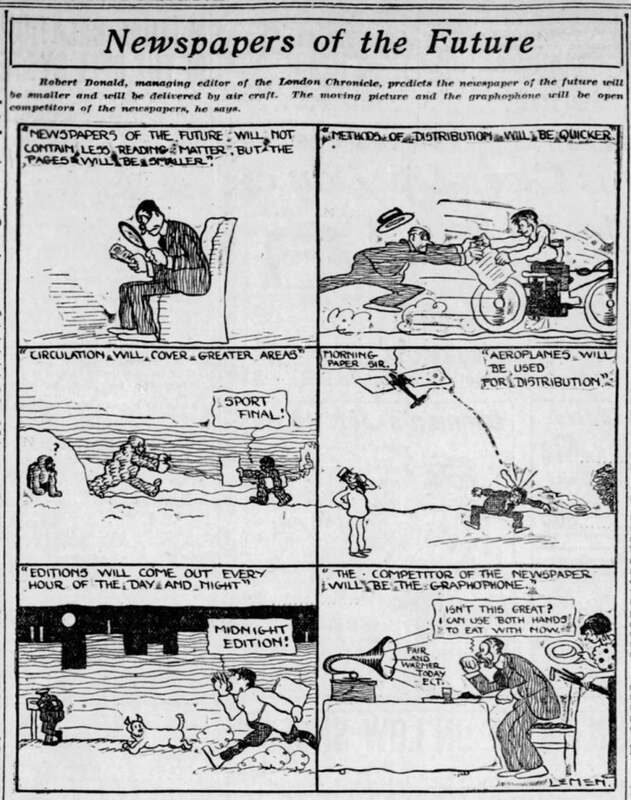 The 20 August 1913 edition of the St. Louis Post-Dispatch reprinted a cartoon from the London Chronicle about the newspaper of the future. And it serves as a fascinating snapshot of an era when automobiles were still relatively new, powered flight was just a decade old, and broadcast radio was still for early adopters. The first two panels of the six-panel comic strip explain that the newspapers of tomorrow will be smaller and yet contain just as much news as before. And the method of distribution will become much quicker, thanks largely to the use of cars. By the third panel, the comic jokes about the spread of newspapers to incredibly remote areas, and then talks about the use of aeroplanes for delivery. Of course, the dawn of the internet brought some radical predictions for the future of news as well. In 1994, newspaper company Knight Ridder predicted that people would read newspapers on tablets—an incredibly prescient idea that would have seemed silly until the introduction of the iPad in 2010.